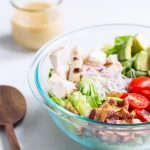 This Chicken Bacon Avocado Salad is packed full of tasty flavors and satisfying textures, making it a healthy, colorful, filling lunch or dinner. 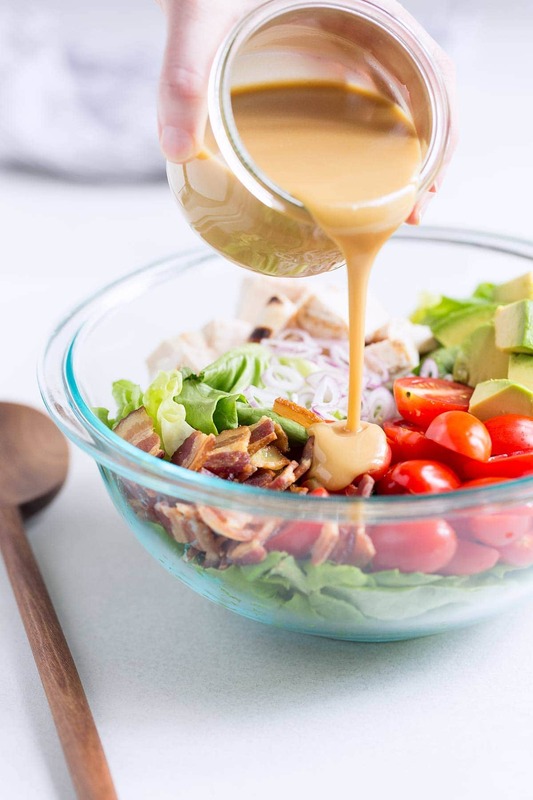 Homemade honey mustard dressing rounds out the ingredient list, which also includes tomatoes, Bibb lettuce, tomatoes, and shallots. If I were to create a list of my top 10 favorite ingredients, bacon and avocado would definitely be right up there. I could go on about the many reasons I love them (yada yada umami, blah blah richness), but I’m sure you’ve heard it all before. In addition to being wonderful on their own, avocados and bacon are excellent options when you need to jazz up those less glamorous ingredients like chicken breasts. 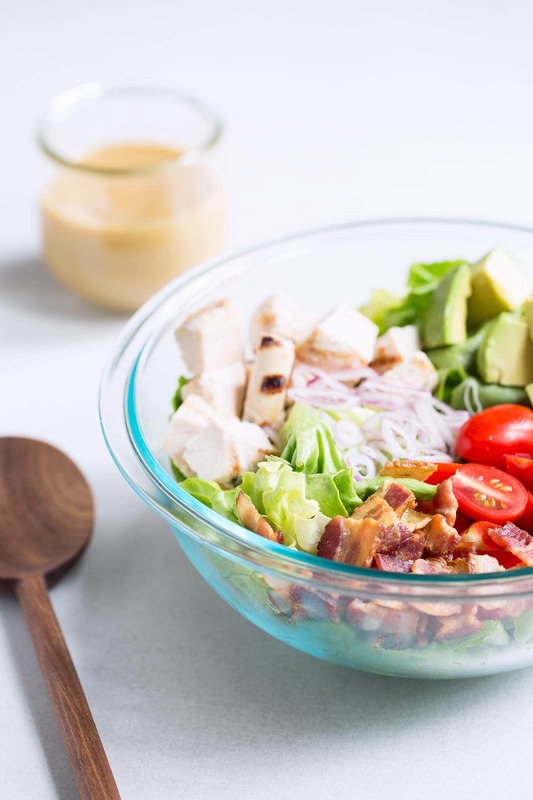 This chicken bacon avocado salad is a great lunch or dinner option. I personally love enjoying this for lunch because it gives me tons of energy to power through the rest of the day! I like preparing the bacon in the oven as opposed to on the stovetop. I love using shallots in salad recipes since they’re very mild, but you can substitute red onions. You can save time by purchasing pre-grilled chicken. Many grocery stores carry it in their prepared food aisle or at the salad bar. You could also use shredded rotisserie chicken (remove the skin). Here’s a tutorial on how to poach chicken breasts. This salad will work with either store-bought or homemade dressing. I obviously prefer homemade. I’ve included the recipe in this post, but if you’d like a standalone version to print and keep on handy, here’s my recipe for honey mustard dressing. You may also like My Favorite Guacamole, Sweet Potato, Apple and Avocado Salad, and Avocado Toast with Asparagus and White Beans! 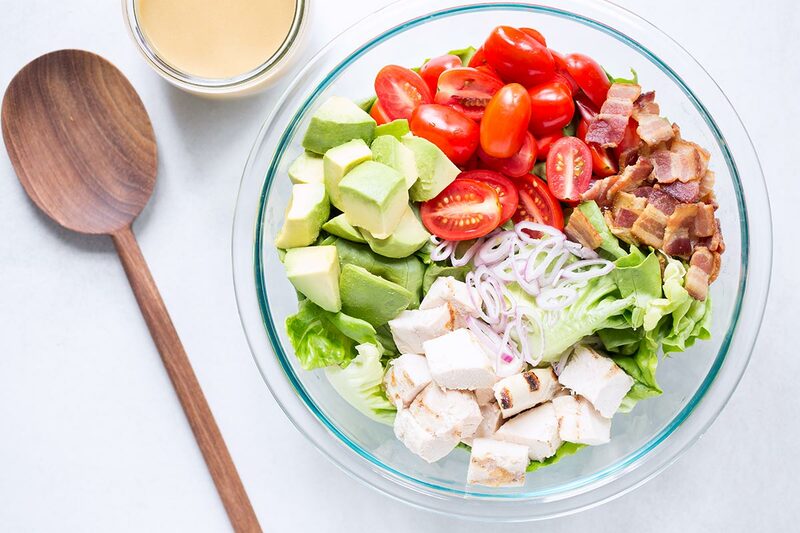 This Chicken Bacon Avocado Salad recipe is packed with flavors and satisfying textures. It makes a healthy, filling lunch or dinner! In a large bowl, combine the lettuce, chicken, bacon, avocado, tomatoes and shallots, gently tossing to combine. (Note: If the avocado is overly ripe, you may want to hold off on adding it here so the pieces don’t disintegrate. Instead, add the avocado in after tossing the other ingredients with the honey mustard dressing). In a small bowl, whisk together the honey, mustard, vinegar, and salt. Whisk in the olive oil until the dressing is smooth. Add half or 2/3 of the dressing to the salad, tossing with the ingredients (don’t add all of it at once; you might not need the full amount). Taste the lettuce and add additional dressing if desired. Leftover dressing can be stored in the refrigerator in an airtight jar for up to 3 days. Re-whisk before using. I like preparing bacon in the oven as opposed to on the stovetop. You can save prep time by purchasing pre-grilled chicken or using shredded rotisserie chicken without the skins. If you have a bit more time (and want to keep things more budget-friendly), here's an easy tutorial on how to poach chicken breasts. I love every ingredient in this salad! SO many favorites in every bite. I’m making that dressing ASAP! This is basically a bowl filled with all my favorite ingredients… and that dressing! Yum! This makes me feel like I’m in a restaurant! Perfect lunch for the weekend- thank you! You have my heart with this honey mustard dressing!!!!!! I swear this salad was custom made for me! Absolutely delicious! 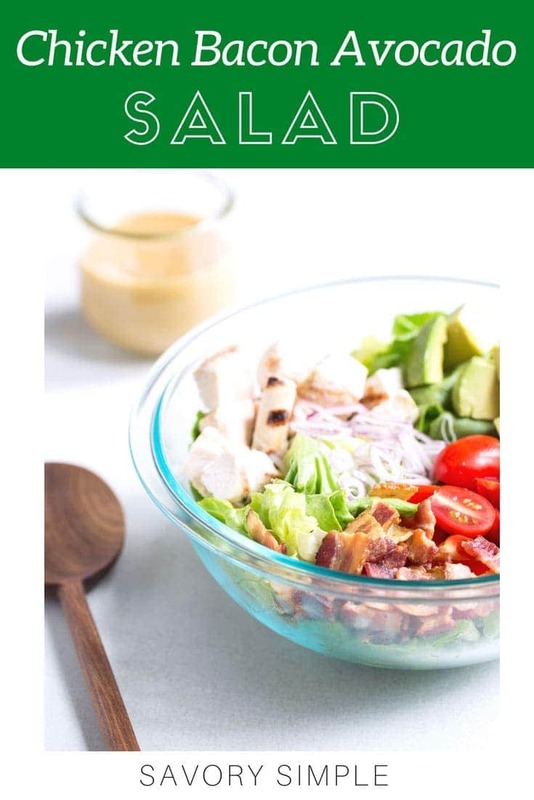 I love everything about this salad, especially the bacon! YUM!